TAHOE/TRUCKEE, Calif. — A real plane, a Cessna 152 primary flight trainer, fits in the KidZone Museum. Proof that amazing things happen in small places when people have big dreams. 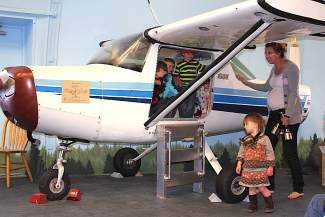 KidZone Museum launched its new exhibit “Take Flight Tahoe” on Friday, May 17 with a group of volunteers, donors, members and staff in attendance. The Truckee Tahoe Airport District’s (TTAD) $30,000 museum grant helped this exhibit come to life. The Cessna 152 will “travel” to world-wide destinations. July through October, India will be depicted by themed costumes, books, music, duty free stores and a cafe. Prior to boarding the plane during the month’s specified travel location, each child will receive a “Take Flight” passport. Children are encouraged to bring their passports to the museum and log where they’ve flown, as though they were going through customs at an actual airport. Truckee Tahoe Airport District’s donation provided the funds needed to construct the new exhibit: the transportation of a real plane on a flatbed truck from Sacramento; the construction of a control tower, a hangar, a hotel, café and terminal, and funds to stock the exhibits with innovative materials. Doug Hartline, owner of Hartline Construction in Squaw Valley designed the exhibit and all structures, such as the replica control tower. Hartline donated more than 40 hours working on the exhibit during the evenings. Hartline Construction employee, Jeff Weingard, spent more than 100 hours to make certain all construction was completed, solid and ready for the grand opening. Truckee Tahoe Lumber donated the wood and Truckee’s Ace Mountain Hardware donated a portion of the paint and supplies. Teichert Foundation, a long-time supporter of the museum also granted the museum $5,000 for “Take Flight Tahoe.” Fred Teichert’s passion is to support nonprofit organizations that support youth. Teichert Foundation has supported the museum for 10 years. When visiting “Take Flight Tahoe,” pay special attention to the fine details. The interior blue sky was generously completed by Truckee-based Kelly Brothers Painting. Deborah Kelly, owner of Kelly Brothers, has been an avid supporter of the Museum for years. Both Kelly Moore Paints and Ace Mountain Hardware donated the paint. “We were enthusiastic about painting the entire inside of the tent structure to resemble the sky and create the background for muralists Sara Smith, Susie Alexander and Makenzie Wrinkle to create their artwork. I have been a member of the committee for over two years because I love being creative and my grandchildren love to play at the museum,” said Deborah Kelly. Every exhibit at KidZone Museum begins with an idea from a visitor, a member, or a friend. The Exhibits Committee is comprised of a group of volunteers along with small business partners and community members with special skills who donate their time and resources to assist in the development of one-of-a-kind exhibits. Many key donors and volunteers spent hours of time and donated generously to make “Take Flight Tahoe” a reality including: Placer County First 5, New Leaders, Precision Flooring, The Armstrong’s, “Grandpa” Jerry Johnsen, Maria Snideman, Kevin Smith, Diana Pruski, KidZone Museum staff and local business and restaurants who donated food for the volunteer crews. For more than 20 years, KidZone Museum has served as the local nonprofit children’s museum of Truckee with programs designed to promote healthy child development and learning through play. Featured exhibits change periodically and always include multidimensional educational experiences. 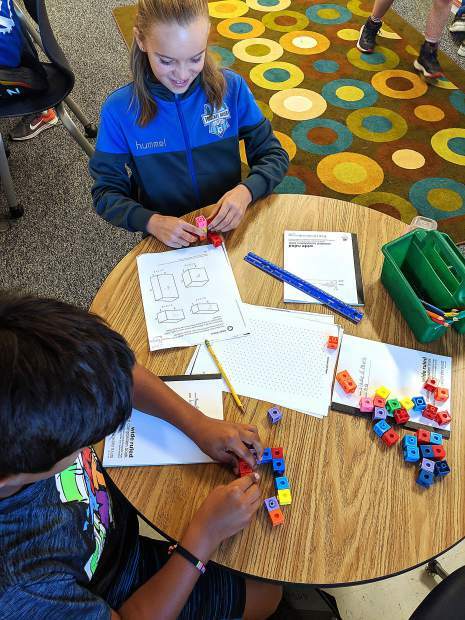 The Museum offers free bus service from Kings Beach to Truckee through its nationally awarded outreach program, and offers annual Lawrence Hall of Science Festivals for regional second graders and preschoolers. The Museum’s mission is to inspire learning through creative play and discovery. To learn how you can support these programs or if you would like a tour of the Museum call 530-587-KIDS (5437). For additional information visit http://www.kidzonemuseum.org or http://www.truckeetahoeairport.com.